It was one of those days that began early, the coffee was perfect, the weather was great, the birds were singing obligingly in the Ashoka tree outside my window and Abida was singing. Work was flowing and I was having one of those magical mornings. However the innumerable inevitable distractions that a working Monday brings with it made their presence felt and I lost pace. Work became a burden as I struggled to finish writing those last 200 words that would signal the end of the assignments to be submitted today. I finally finished at about 3pm and I realised I was ravenous. (Of course it was also one of those days when the watchman came by to inform me that there would be a water cut for most of the day.) So what to cook really quick without involving too much prep and resulting in minimal dishes piled up in the sink? I rooted around in the fridge and found these beautiful boneless pieces of Bekti or Bhetki (as we Bongs refer to it) that were already marinated in salt and turmeric. Bingo! A quick call to my Mom and lunch was sorted. Sorse Bhetki with hot rice was ready in a jiffy and a few minutes! Soak a generous tablespoon or two of the mustard powder in a small glass bowl, depending on the quantity of fish you will be cooking and whether you want lots of gravy or less. 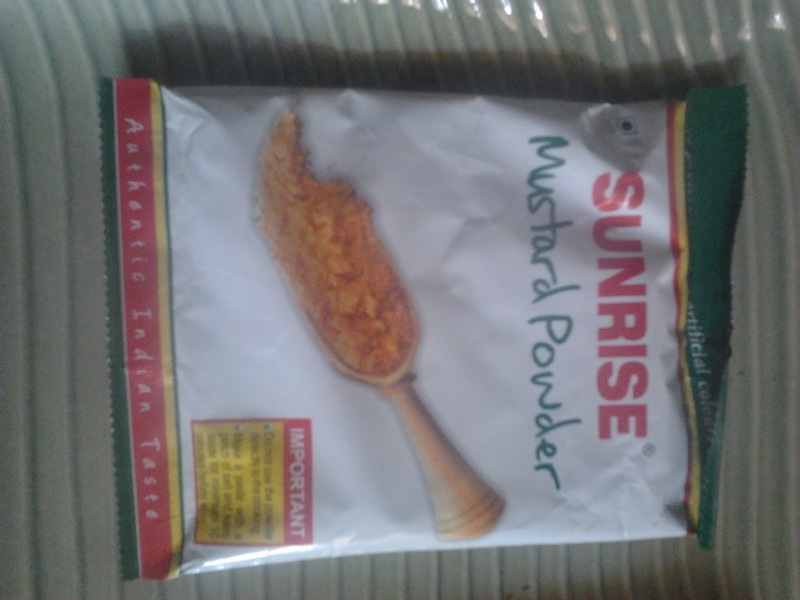 I used this mustard powder. It is my latest hot favourite short cut in the kitchen and Mom got me about 10 packets when she came from Kolkata last month. It's also available here and there in Mumbai including at the amazingly well stocked Bong speciality Pooja Bhandar outside the Chembur market. It packs a reasonable mustard-y punch but is not so strong that those not genetically programmed to feel absolute delight with mustard can also enjoy it. 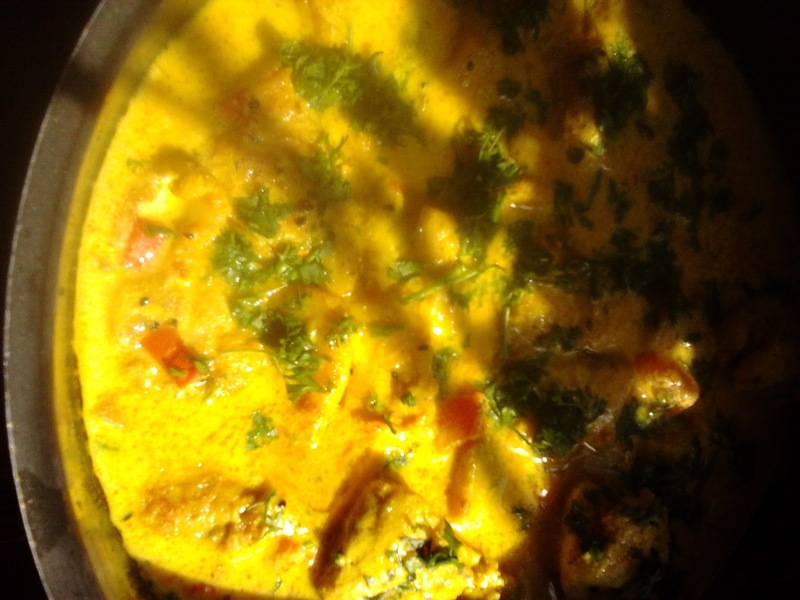 Take a large flat cooking vessel and heat the mustard oil. Add the fresh green chillies (snap into two or three pieces) and the kalonji seeds. Add in the fish pieces and fry gently. Keep the flame on simmer or just a little more. You only want to gently sear the fish, not fry it hard. After a few minutes add in the chopped tomato. Stir gently and cook covered for a couple of minutes. once the tomatoes are mushy but not completely disintegrated, pour in the mustard paste/solution. Stir to coat all the fish properly. Add water according to the consistency of gravy you prefer but make sure there's enough to cook the fish. Once the fish is cooked through switch off flame and take the pan off the hob. Sprinkle liberally with fresh chopped coriander and pour a tablespoon of mustard oil over the surface to finish. This is totally the kind of dish I like--simple and flavorful. I remember you buying the mustard powder the other day and now I regret not having bought any for myself. I love the sunny quiet of the last picture and those potted plants are so cheerful! I'm thinking if i can make same curry using tiny brinjals and potatoes instead of the fish, and ofcourse, will have to grind my own mustard powder. Absolutely lovely! I use this mustard powder too, and lazy that I am, cook a further quicker version of shorshe maach by adding the mustard paste, coconut milk, fish/prawns, mustard oil and green chillies and popping it into the microwave for 6 mins. Also, with this powder, I add it to water and wait for about 10 mins for it to dissolve well.